Managing Environmental Compliance will provide resources to explain and clarify the changing regulations, and help course participants spot potential environmental hazards before they occur. The three-day course will be held in Atlanta at the Georgia Tech Global Learning Center Oct. 2-4, 2012, with additional course offerings in 2013. The course will provide resources to explain and clarify the changing regulations, and help participants spot potential environmental hazards before they occur. The Environmental Protection Agency (EPA) continually evaluates and revises regulations relating to environmental hazards, which can impact the daily operations for many organizations and businesses. Companies must stay current and adhere to the ever changing policies, environmental laws, regulations, and permits, otherwise face costly fines. 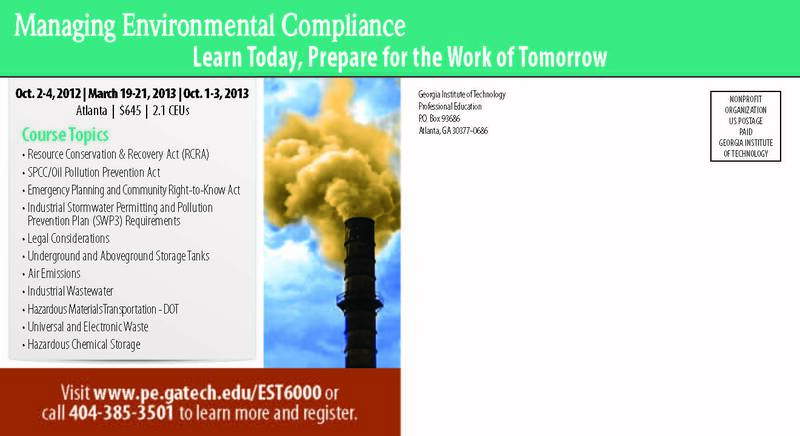 Georgia Tech Professional Education’s Managing Environmental Compliance (EST 6000) course will provide resources to explain and clarify the changing regulations, and help participants spot potential environmental hazards before they occur. The three-day short course will be held in Atlanta at the Georgia Tech Global Learning Center Oct. 2-4, 2012, with additional course offerings in 2013. 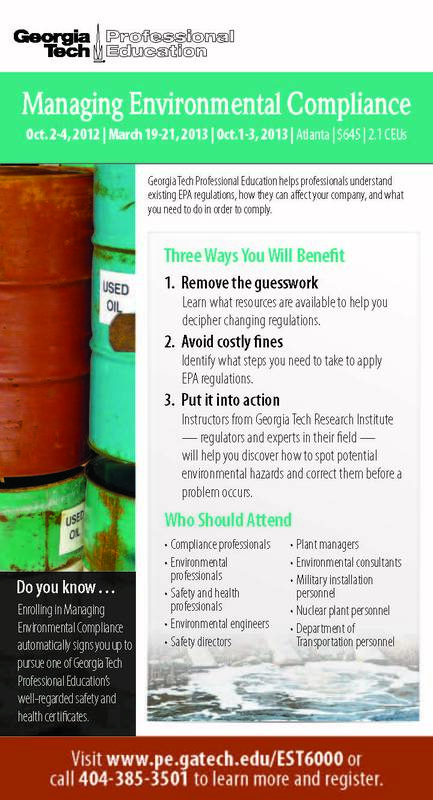 The resources and information provided in the course will help employees save time and money when applying EPA regulations in their respective facilities. Participants will learn about procedures to handle and mitigate environmental issues. Course topics include but are not limited to the Resource Conservation & Recovery Act (RCRA), emergency planning, air emissions, hazardous materials transportation, and the SPCC/Oil Pollution Prevention Act. This course will benefit compliance professionals, environmental professionals, safety and health professionals, environmental engineers, safety directors, plant managers, environmental consultants, military installation personnel, nuclear plant personnel and Department of Transportation personnel. Monti Staton and Vicki Hanrahan Ainslie, research scientists with Georgia Tech Research Institute (GTRI), are the instructors for the course as well as directors of the Managing Environmental Compliance program. Staton is the manager of the Georgia Environmental Compliance Assistance Program, which conducts environmental compliance audits and provides technical assistance for Georgia industries. Ainslie currently works in the Human Systems Integration Division at GTRI and has experience developing compliance programs for lead and asbestos exposure as well as evaluating and conducting site assessments for environmental, health and safety standards. Georgia Tech Professional Education is an academic division of the Georgia Institute of Technology, which consistently ranks as one of the nation’s top 10 public universities by U.S. News & World Report. Professional Education offers professional master's programs, short courses, and certificate programs to meet the needs of working professionals and industry partners. Programs are available worldwide through a variety of face-to-face, blended learning, and online formats. In addition to professional course offerings, the division administers K-12 outreach and English as a Second Language programs, and manages meeting and event facilities. Professional Education serves and educates more than 3,100 companies and over 13,000 individuals on an annual basis, and is located at the Georgia Tech Global Learning Center in Atlanta and at the Georgia Tech-Savannah campus.